What can you do if you have a missing tooth? Many people suffer from the effects of having to live with a missing tooth, or even missing teeth. These generally unsightly gaps can be caused by tooth decay and extractions, or as a result of some trauma. The thing is, you don’t have to learn to live with it and at Carisbrook Dental there are a number of ways in which we can help you regain your smile and your confidence. Let’s look at your main options. Option one. Do nothing. Yes you could ignore it and put up with the gap. It might be the cheapest option, but it is certainly not the best. In addition to distorting your smile, affecting your appearance and producing a poor bite, there is also a possibility that the adjacent teeth can begin to move into the gap, causing the roots to become exposed and enhancing the risk of decay. Option two. Dentures. We can make you a denture that you wear with a false tooth to fill the gap. It is an inexpensive option and the resultant appearance can be excellent. You have to be aware though that over time dentures can become loose and discoloured. They can also affect the adjacent teeth and can occasionally cause embarrassing moments whilst talking or eating. Option three. A bridge. 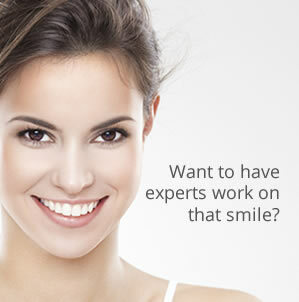 Our expert cosmetic dental experience means that we can produce a bridge incorporating a replacement tooth to disguise the gap. To do this we to prepare the two adjacent teeth and join them together with a bridge that incorporates a specially made false tooth/teeth. This is not too expensive and it is a quick and efficient means of overcoming the problem. Unlike a denture it won’t come out during conversation or a meal. Points to remember though are that to fit the necessary bridge we have to trim down the two adjacent healthy teeth. The lifespan of a bridge is generally between 15 – 20 years, after which the procedure will have to be repeated. And if any of the treated teeth are chipped or damaged then we have to replace all three teeth. Option four. Dental implant. This is undoubtedly the ‘Gold Standard’ solution and at Carisbrook our reputation for excellence is of such a high professional standing that more and more dentists are now referring their own patients for dental implants at our clinic. The procedure involves us implanting a stud into the jaw where the gap is, then after approximately a four-week wait, while that heals, we attach the replacement tooth. The advantages of a dental implant are that it looks totally natural, it doesn’t affect or damage the adjacent teeth and our success rate is well over 90% even after 20+ years, providing you still maintain regular routine dental treatment. Some people think that dental implants are expensive and it is true that in the short term the costs can be significant, but when viewed over the long term, dental implants undoubtedly represent the best value for money and are the cheapest option.